Tucked away in the most hidden corner of Shoreditch is a mysteriously lavish utopian world. Stepping from the streets of Shoreditch into a magical forest, leaves tumble from the ceiling beckoning me inside. Walking through a succession of themed areas – baroque, the cage, the gold room – I've been led into a fairytale as bejeweled horns, a hippo head, mouth open in roar, and taxidermy deer all peer in bemusement at the strange guest. The quirky trio responsible for Les Trois Garcon set up the bar to provide somewhere for their deliciously full clientele to whet the whistle from a delightfully comprehensive selection of cocktails. Since opening, they have received a range of prestigous awards such as The Evening Standard's Bar of the Year, Time Out's Best Bar Design and the impressive accolade of Observer Food Monthly's Best Bar in Britain. The cocktails are like characters from our fairlytale, with names to match their personality: 'Femme Fetale', 'Japanese Rocking Horse', 'Basil Blade'. The extensive list displays skillfully subtle flavor matching and each is finished and presented with the same attention to detail of the venue design. Priced at around £9-11 and offering a selection of Japanese bar snacks for those not stumbling round the corner from the sister restaurant could make for a potentially pricey evening. 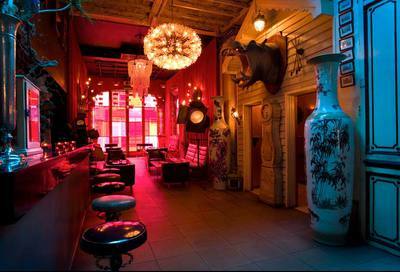 But who can afford not to be seen at the most stupendously cool bar in town?